What causes ice formation on aircrafts during flight? 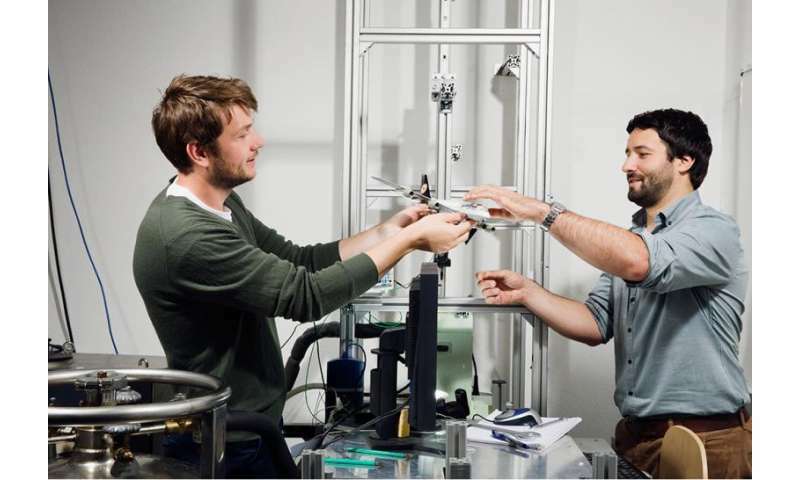 Markus Schremb and Daniel Kintea of the TU Darmstadt are carrying out research into causes of ice formation on aircraft during flight. Their experiments and realistic mathematical models are aimed at the minimization of risk and costs. When Air France flight 447 crashed over the Atlantic in the night of the 1st of June 2009 en route from Rio de Janeiro to Paris, killing 228 passengers, nobody suspected that the catastrophe had been triggered by ice formation on the speed sensors. The autopilot had switched itself off in response to the ice-over and the flight control had transitioned to an alter native mode. Instead of initiating the standard operational procedure prescribed for this situation, the pilots made one mistake after the other. This led to a wing stall followed by a loss of lift, and the aircraft plunged into the ocean. Ice crystal accretion remains a serious hazard in aviation. For this reason, all new aircraft types need to prove, prior to approval, that they can continue to fly safely even under conditions of in-flight ice accumulation. This involves a complex and laborious certification process requiring expensive flight and wind tunnel testing. "There is only a handful of facilities in the entire world that are equipped for such tests," says Dr. Ilia Roisman of the Institute for Fluid Mechanics and Aerodynamics at the TU Darmstadt, who, together with Dr. Suad Jakirlic is supervising the work of Kintea and Schremb in this specialist field. Professor Dr. Cameron Tropea heads up the institute. "If we can better understand the physics of surface icing and are able to replicate it in realistic mathematical models," Roisman continues, "then the wind tunnel experiments required for the certification of new aircraft types should be less expensive." And this is precisely where the work of Schremb and Kintea comes in. Both of them are carrying out their research in the context of larger projects. Schremb is collaborating on SFB-TRR75, whilst Kintea is involved in the EU's HAIC project. The scientists are researching two different kinds of ice accretion. Schremb is concerned with wing icing through supercooled water droplets during climbing and descent following take-off off and prior to landing, respectively. Kintea is researching the accumulation of ice in engines and on sensors when flying through ice crystal clouds at cruising altitudes. Without counter-measures, both types of ice accretion would have dramatic consequences for flight safety. Ice build-up on the wings changes the wing profile cross section. The growing ice layer increases the weight of the aircraft, reduces lift and increases drag. Without counter-measures, the aircraft consumes more fuel and may even become uncontrollable. Currently, heating the leading edge of the wings causes the ice layers to melt and fall off. Icing of the engines at high altitude blocks the airflow, which results in a loss of thrust and efficiency and, in the worst case scenario, to engine flame-out. Airplanes come into contact with supercooled water when flying through low-lying clouds, because supercooled water droplets only exist in the subzero range down to approx. -20oC. Schremb is investigating the hydro- and thermo-dynamic processes at the point of impact and the freezing of supercooled droplets, in order to be able to model these processes. "When the supercooled droplets in the low-lying clouds come into contact with those parts of the aircraft profile directly exposed to oncoming air currents, then a portion freezes to ice immediately," Schremb explains. also freezes due to the low temperature of the underlying structure." Because the air temperature sinks with increasing altitude, and water only exists in the form of ice below approx. -40oC, ice accretion due to supercooled water droplets can only occur at certain flight altitudes. Schremb is particularly interested in the crystalline structures formed during the freezing process, the socalled dendrites. He has been able to demonstrate that, whilst the crystallization front consists of a multitude of dendrites, these dendrites do not influence one another. According to Schremb, "a collection of dendrites freezes at precisely the same rate as any single dendrite. That is why it is only necessary to model the solidification front as a whole, rather than every single dendrite. That will significantly simplify the calculations." Schremb has also succeeded in demonstrating that the thermal properties of the surface influence the freezing process, specifically by way of the accretion angle of the solidification front. "If," he concludes, "it proved possible to maximise this angle by means of appropriate measures, then this would minimize the speed at which the surface would ice over. That would represent significant progress." Daniel Kintea is investigating engine icing at high altitude. This problem can occur either when flying through ice crystal clouds or when flying over storm cells at cruising altitude. In this case, the ice-formation process begins on a warm surface. For many years this problem was not clearly recognized, because it was thought that the ice crystals would bounce off the cold parts of the engine and melt on the warm parts. However, under certain conditions a significant accretion of ice can occur. "That may sound paradoxical," says Kintea, "but even sand will stick to a sloped surface when it is wet." In the case of engine icing, ice crystals are ingested into the warm engines where they melt. The result is a mixture of water and ice, which adheres to the surfaces, just like wet sand. As these adhering particles melt, they further reduce the temperature of the metal until the freezing point is reached. Then the water film freezes on the surface to which the cold ice particles are stuck. Sensors can also freeze over as a result of this same principle, as was the case with the Air France accident. Until now, pilots have attempted to circumvent ice clouds and storm cells, or else to descend to a warmer layer of air, in which the ice can melt. "We want to create precise models of these ice accretion processes," says Kintea, "in order to do so, we need to know what these ice particles look like in the air, how they behave, what drag they have, and how they melt. One fundamental assumption of previous models has been that these ice particles are spherical, and melt in the same way as a sphere. That is wrong." To date, Kintea has modelled three processes: the melting of a single ice crystal; the collision, and the behavior of a porous ice layer. As the mechanical engineer explains; "whether ice particles bounce off or stick, depends upon the collision velocity, the surfacetension, and the size and density of the ice particles. These four variables are combined in the non-dimensional Weber number. Below a critical Weber number, the particles stick." Kintea has also considered the physical phenomena associated with the melting of porous materials. His mathematical models represent reality far better than previous simplified and idealized models.